Been a great couple of days with the Izoard and Galibier only open for cyclists first thing in the morning here in Serre Chevalier. 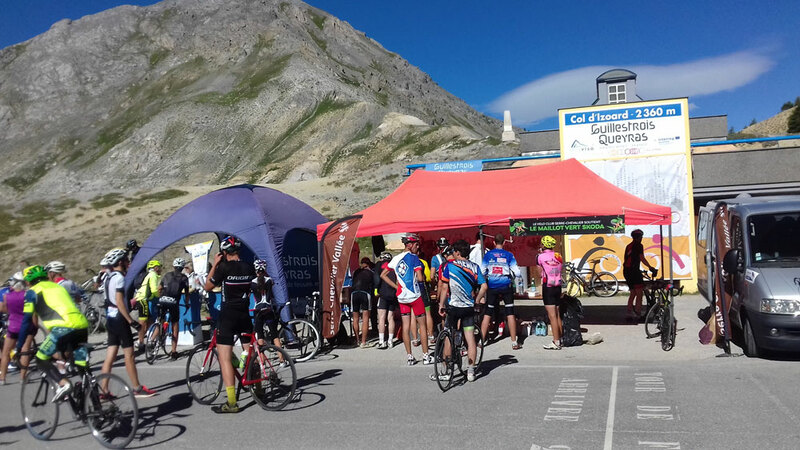 That's when from 08:00 to 11:00 the Galibier and Izoard are only open to Cyclists. 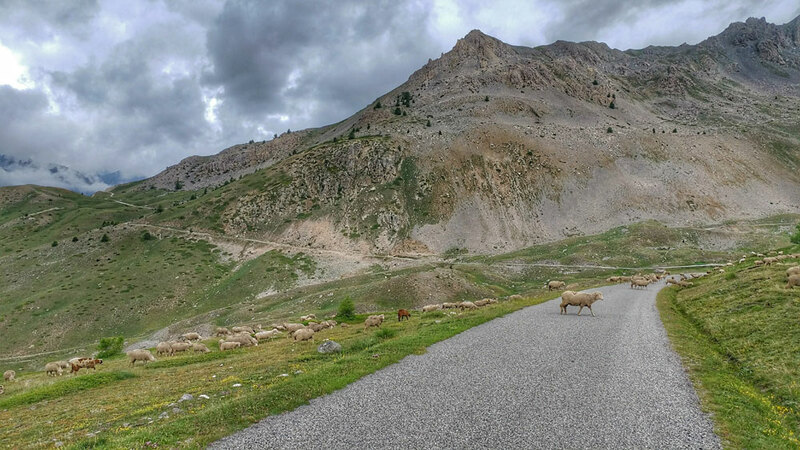 It was the Galibier on Thursday and the Izoard yesterday. 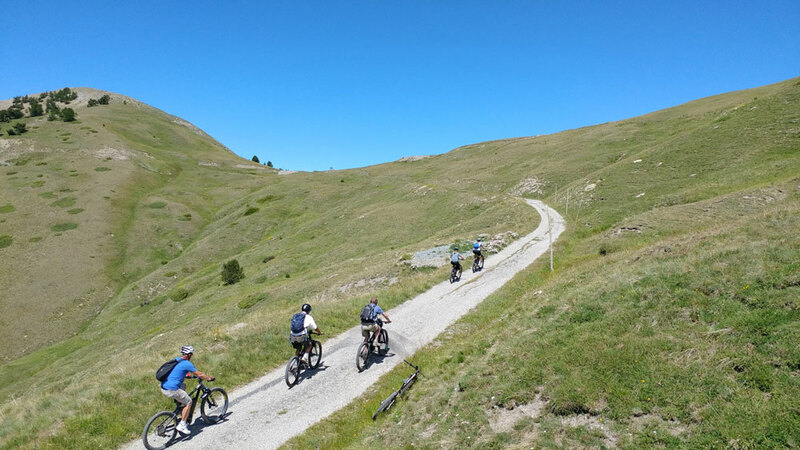 It's a great atmosphere and great for descending without the fear of cars and motorbikes, though it's amazing how cyclists can wander across the road as they climb up! TAKING THE E-BIKE DUDES OUT FOR A RIDE. I WAS STILL PEDDLING THOUGH! Yesterdad I took five geezonaires out on a long ride, some 55Km and 1,500m climbing all on MTB E-bikes whilst I was still "peddling". These are people who would never ever do a ride like this, and a few were not too well synced with body and machine and we had a few "offs" but I was so glad to get to the end without more than a few cuts n'braises and a smashed watch. Luckily they were paranoid about using their batteries up so on the whole I stayed ahead on the climbs enabling me to take photos. It was a mamouth day for them, and they were so stoked at the end. 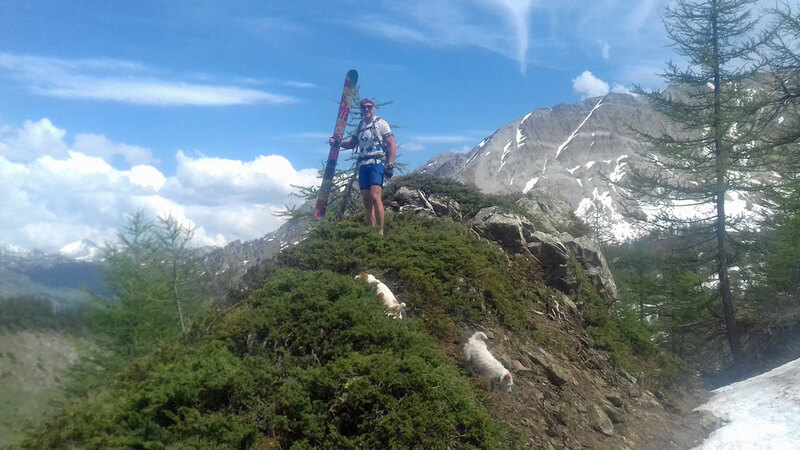 As the weather again was suspect today was not a day to go too far and high, so this time the same route with Elaine and Les Chiens up to Frejus and Le Pi Maï. With computer GPS bike technology combined with Strava it's now possible to race against yourself so you can see your Previous Best (PB) on the bike computer screen as you cycle and see how far ahead / behind you are. And yesterday without the aid of the computer I pushed it and was only 90secs off my PB so decided to download the "climb" segment and race against it and manage to knock over 2mins off my PB having cycled it some 15 times previously! And somehow knowing how painful that attempt was do not think I'll be doing that again! Pics of Elaine and Les Chiens are integrated into the video. And a little spin up to the Summer village of Frejus and Le Pi Maï. It's a great little loop to stretch the legs! Spectacular stunning ridge hike that's been on my bucket list for a long time. 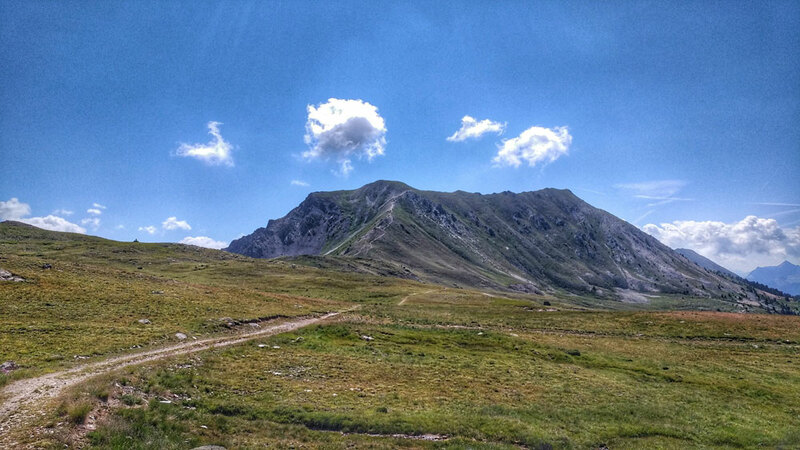 Crete de Peyrolle from the Granon along the ridge then descend to Briancon. 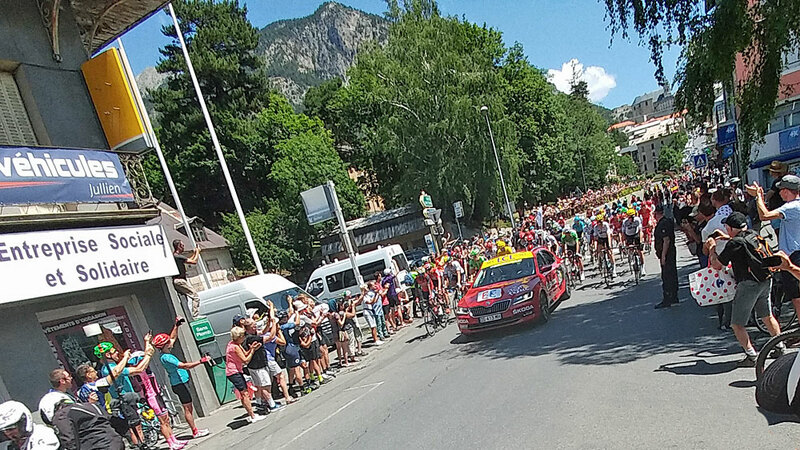 Thursday saw the Tour leave the valley with the Grand Depart in Briancon, I went down and was able to view the start from two locations as they went past me I then sprinted along the road to see them coming back down. As the Izoard road was closed from 07:00 I was not able to cycle up there as planned, though I did hear later that it was open after the womens race finished, but instead we chose to watch the Izoard climb in the Frog with many others and was a great atmosphere. Afterwards we walked down through the Media Village and sought out the ITV4 Team. We knew it was going to be kind of a special day and it truly lived up to all expectations. 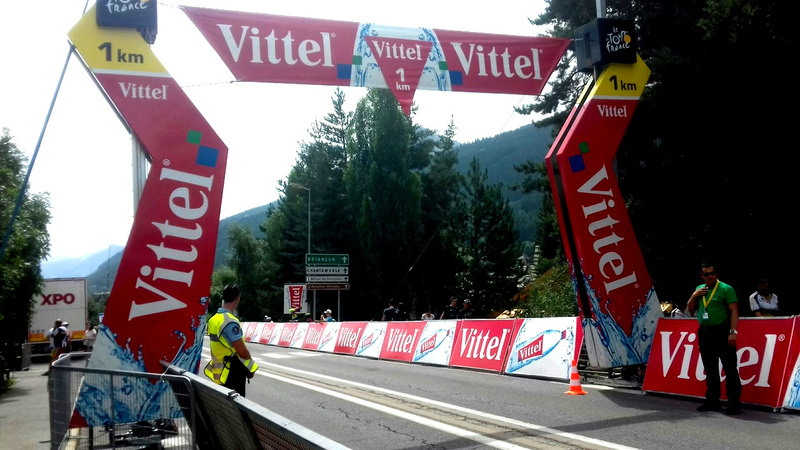 We watched the race on television as they climbed the Galibier and then descended down to the Lautaret (having previously seen the caravan trundle through) and then we went back down to our vantage point. 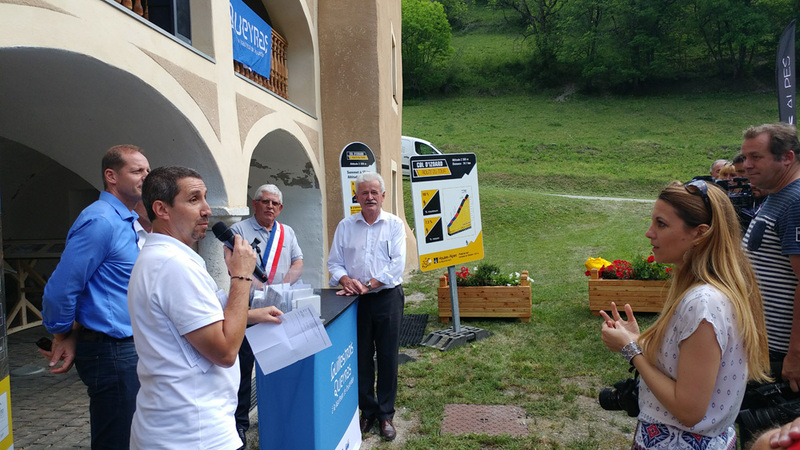 From where we live we can see the Team buses at Club Med and the Grand Aigle where Team Sky are based and in fact some friends caught some great images of Froome cycling back to the hotel in Le Bez as well as Macron doing a walk about in the village near the finish line. 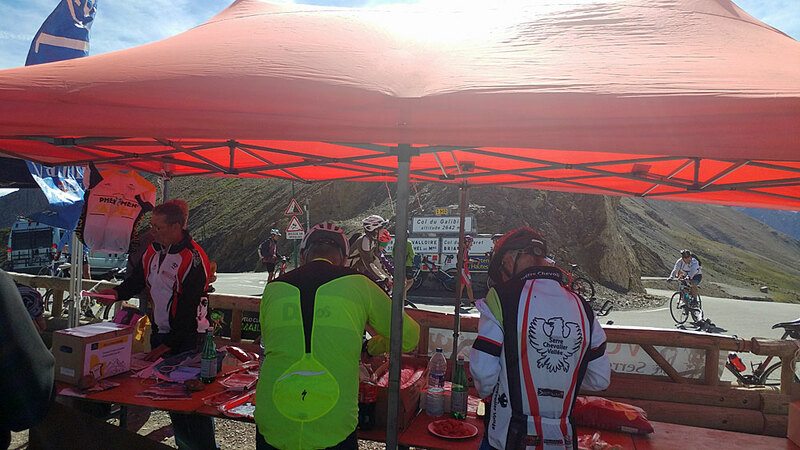 They're on their way, nearly at Galibier before coming past Style Altitude HQ at the 1km kite before the finish at Frejus lift. General consensus was that was one hell of a tough ride. On paper it did not look too bad only 3,600m of climbing and a few of us commented on that the night before, though I did throw the caveat in of 'all depends on the temperatures'. I was off in pen 10, bib number 10,250 though the Live Tracker Timing had me leaving from Pen 1 and somehow taking 2hrs 47m to Savines de Lac where my actual was 1hr 41min? I made good progress to Barcelonnette with the blessed tail wind and arrived at the bottom of the Vars climb not feeling too bad but I knew temps had ramped up so took it easy and was amazed at how many people were all ready off their bikes seeking shelter from the sun and taking a quick rest. 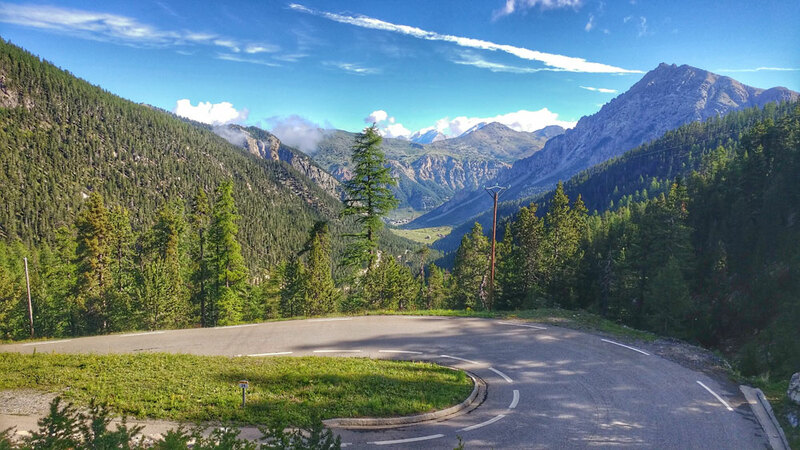 I actually knew I might be in for some pain when I started cramping and going into spasm on the descent about 10km down from the Col, and was thinking if that were to continue I'd best stop and call it a day at Guillestre. Luckily or not the cramps went. All was going well and I made good going in the hot conditions to Brunnisard and a kilometre up from there I went into a series of severe spasms and could not even walk. A cyclist who must have been medically trained spent about 10 minutes with me although a mate rode pass asking 'Are you alright Gav?'. I walked nigh on three km to the impromptu drink station setup by an enterprising chap who was charging €2 a can and after that got back on the bike to make the little descent into the Casse Deserte and was able to cycle up the final 2km to the finish at the Col where it seemed most were walking in temps reported to be 39 degrees! It's a cool sunny morning, 15C at 9am. There's an Etape du Tour app for tracking the riders so we're watching their progress then going up the hill with the Rando Chiens for a mountain lunch. Fingers crossed they all stay safe. Look out for a full first hand report from Gav tomorrow, if he has the energy! Arrived back in the valley in the early hours of Thursday morning and what a difference to when we left! 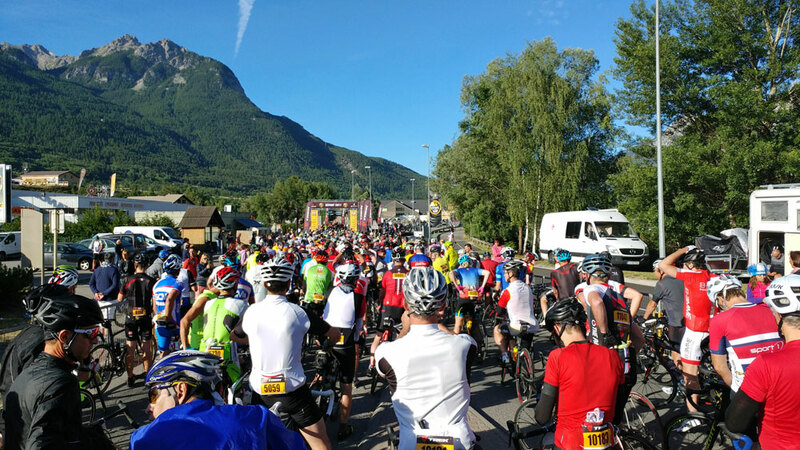 The valley has come alive with cyclists and probably still another 10,000 or so to arrive today and tomorrow for the Etape du Tour on Sunday, and then there's the Tour de France next week. 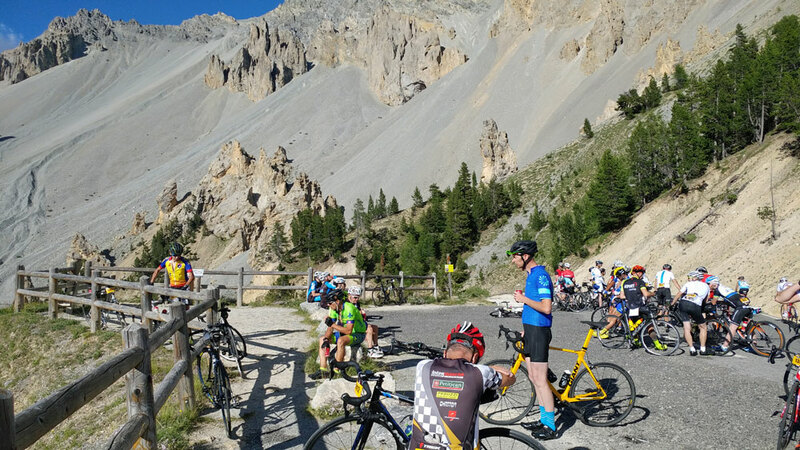 Today riding up Galibier in a group of six at a very slow pace and then this afernoon down to the Etape Village in Briancon to register. Unfortunately last week I received some tragic news in that my best mate died so I'm now back in England and return to Serre Che Wednesday 12th July. The Cols Réservés is when certain Cols are just reserved for cyclists, in that no motorised traffic is allowed up or down for a couple of hours. 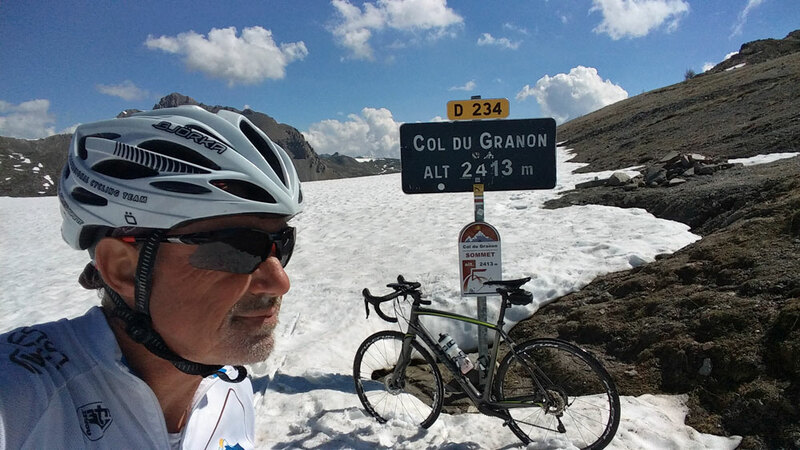 It used to be from 09:00 to Noon but this week it's been 08:00 - 10:00 so for many people that is too early and with the volatile weather we've had this week it was no surprise that there were not too many climbing the Granon on Wednesday. 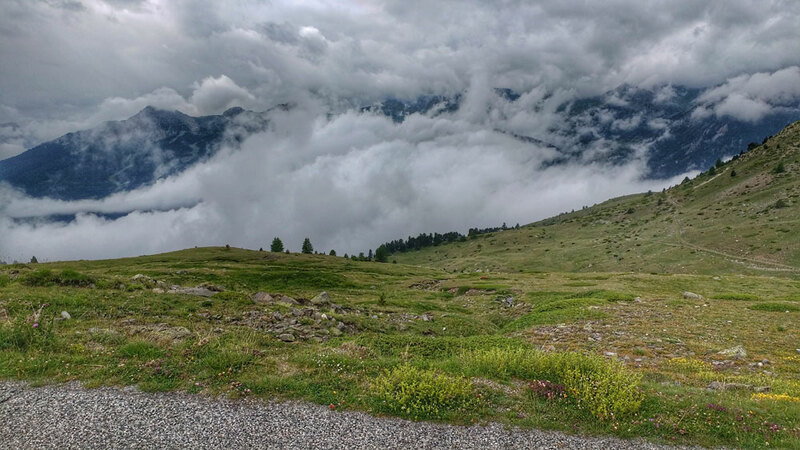 The Col du Granon at 2,413m is nigh on 1,000m climb of pain, the actual Strava segment is one of the toughest in France 11.4km averaging 9% and 999m, and the weather made it worst with low cloud and temps in single figures. As I've been training hard and feeling strong, also helped by loosing around 6kgs, I wanted to see if I could achieve a PB on the climb, helped by having the Strava segment on my Garmin which tells you if you're in front or behind your target time. I was well pleased with beating my previous best time by nigh on 5 mins so the training has gone well, but have to say knowing where you are in relation to the time really helps you make that extra effort. Then today it was the turn of the Col D'Izoard 2,360m which meant leaving here at 07:30 and with a dusting of snow overnight above 2,500m it was very cold with temps as low as 3.5 degrees. It did warm up on the climb to 8 degrees and with the sun out it was not too bad and actually quite pleasant. What was amazing was that it seemed we had the whole mountain to ourselves and we felt very privileged, but it was more to do with the fact that most had not bothered to get up so early, as on the descent there were plenty coming up. 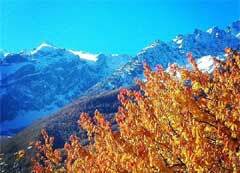 View from the Col across to the Casse Deserte and the fresh snow on mountains in the Queyras. Today's ride was a fair sized chunk (135km) of the Etape du Tour stage, 178km. Major school boy error in that did not pack a jacket as thought we'd miss the rain that was forecast. 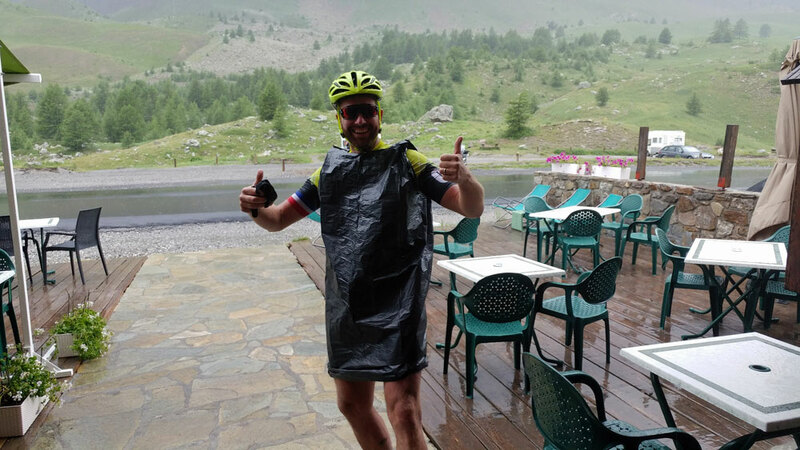 So we went from 30 degrees in the valley to torrential rain on the last 8km of the climb up to Col de Vars as temps dropped to 9 degrees in a squally wind, so cold wind-chill. Decided on a long ride even though it was the weekend and the roads would be busy. In Cesana there was a lovely atmosphere with a market and a commemoration / celebration of Mont Chaberton and "Battaglia delle Alpi" 21 June 1940. Training must be going well along with weight loss as I managed a couple of PB's on the Sestriere and Echelle climbs. Cycling on the road bike up to Sestriere via Sauze di Cesana in Italy you pass a sign for the Valle Argentiera and looking at a map it is indeed a very long valley. As I was collected Elaine from Turin airport later in the day I decided on exploring this valley along with the dogs as there was a river running through the valley along with may streams feeding it so heat should not be an issue. 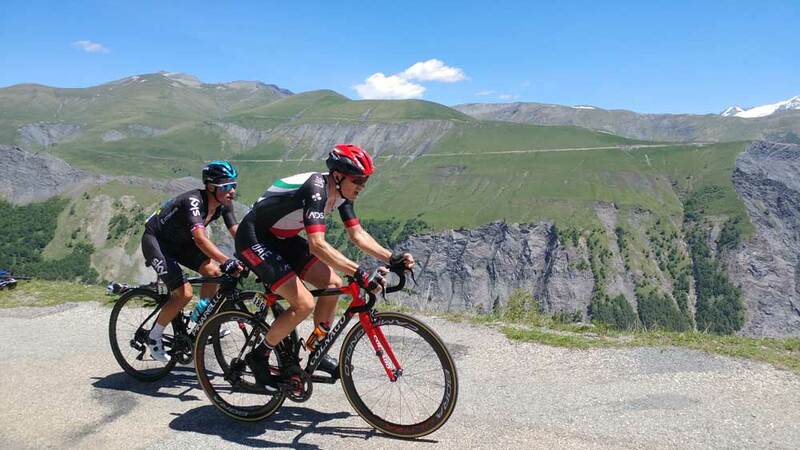 It was around a 250m climb to the valley then it was pretty flat for 6km along it before a final steep climb up the Refufio Alpe Plane at 2090m though it was only once I was there that I saw a much easier, but longer route to get there, which I took on the descent. 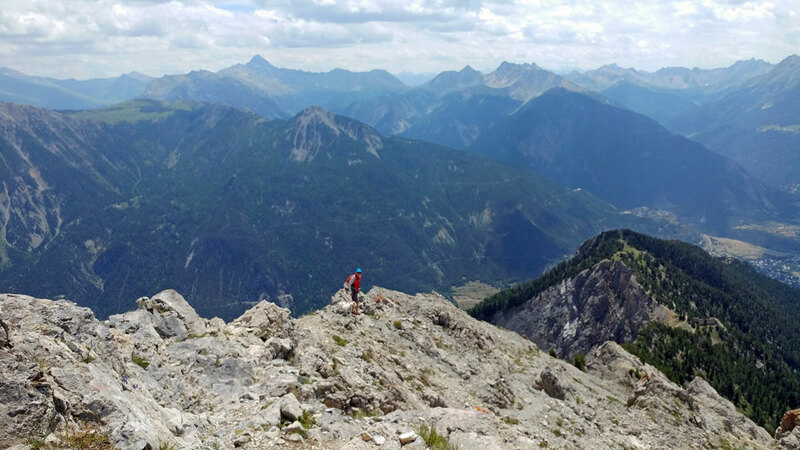 We parked up near Guillestre and headed down towards Lac Serre Poncon, but this time took Les Balcons de la Durance, a stunning traverse above the Durance river in full flow before dropping down to Embrun and on towards Savine de Lac. I've never seen the lake so full and unlike the last couple of rides around the lake there was not a cloud in the sky so the lake was reflecting the azure blue of the sky. It was hot though, temps mid to high 30's in the heat of the sun and on the last big climb up to the Col Lebraut it was like an oven. Managed 130km and just over 2,000m and felt good in the heat, same was not the case for my mate who found the last third of the ride in the intense heat tough going. Yet another great ride. This time accompanied by a mate who was on his electric mountain bike, and it was good to have company on the long climb up. Leaving Briancon heading out on the Izoard road about 3km out there's an old military road that goes up to the Ancien Fort du Gondran ou Sommet des Anges (2459m) above Montgenevre. 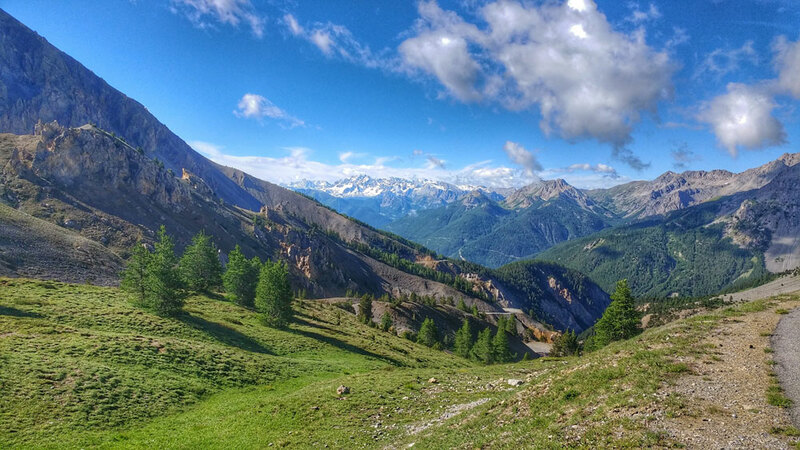 Some 1,350m of climbing, then it's a truly stunning (and long) descent to Montgenevre and then traverse to the forts of Briancon via Bois de Sestriere and l'Infernet. 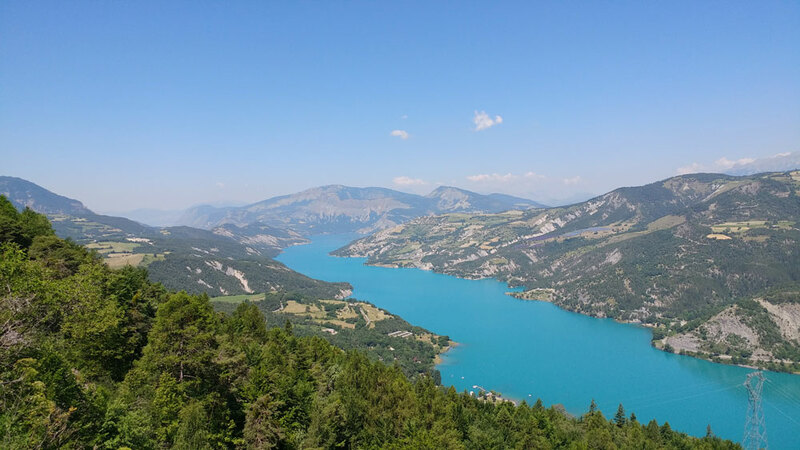 That is to the Etape du Tour (Sun 16th July), which is when nigh on 20,000 cyclists arrive in the valley to cycle a stage of the Tour de France which leaves Briancon and finishes atop the Col d'Izoard. I have around ten mates coming out and now some are beginning to panic at the thought of taking it on as they have not been doing enough training. Cycling 180km in the mountains in temps of 25 degrees is totally different to riding in mid to high 30's and that's what will do for me even with all the training I've been doing! 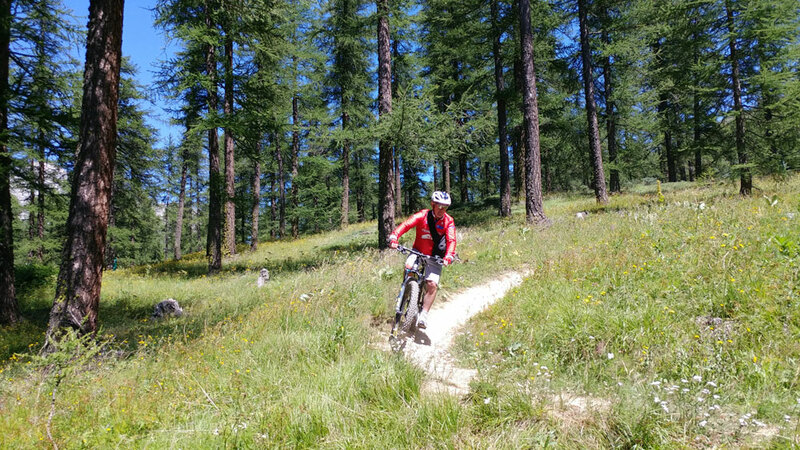 Yesterday did one of my favourite off road rides, Balcons de Serre Chevalier, just me and the marmots. 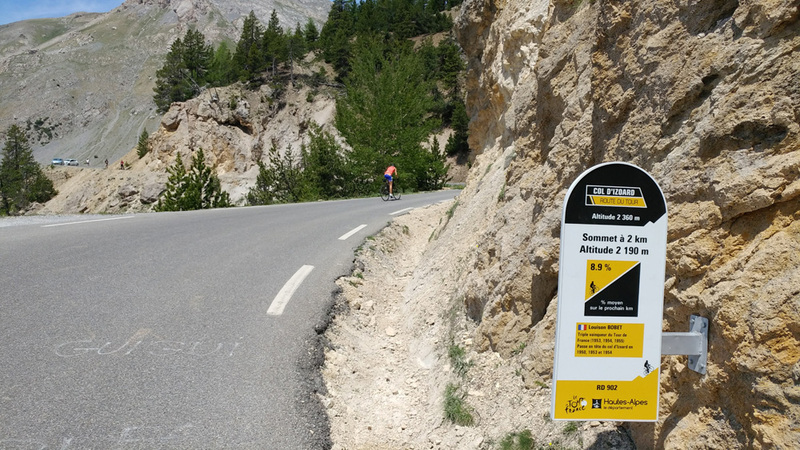 Yesterday the Izoard was only open to cyclists from 11:00 - 14:00, for "Le cadre de la fête du tour, inauguration ce jour-la de la signalétique ASO de montée de Col" which I surmised had something to do with new signs on the road up to the Col D'Izoard from the Queyras side, which is the route the Tour will take and the Etape in July. Sure enough was a melee of people from all the various tourist offices, regions, departments, Maries and the like and they were all celebrating the wonderful new signs and a great deal of back slapping was going on. However, one small problem as I saw it (or didn't). 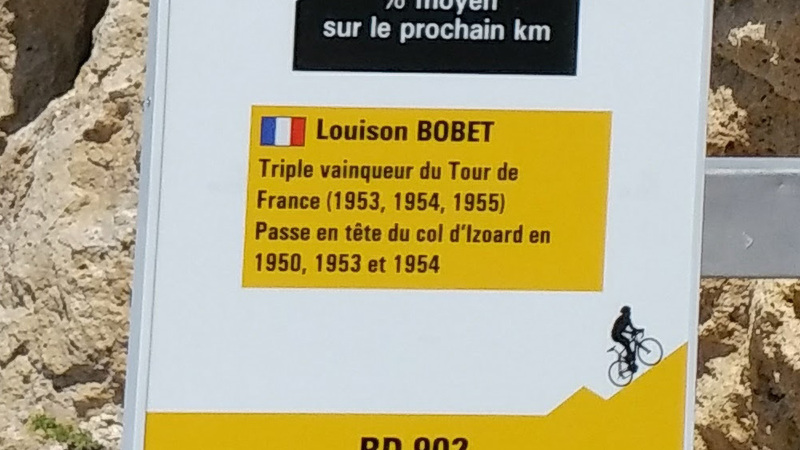 The idea behind the signs was to celebrate the history of the Izoard in the Tour and the many riders who had climbed and went on to win stages but as I cycled pass them (slowly) I just could not read them as the font was way too small. So maybe the designer should have worked that one out with a prototype before going into production! One of the signs, and you are meant to be able to read that small panel below the gradient ! I've ridden up the Izoard from thie direction seven or so times and this time round did not seem to bad (doubt I'l be thinking that on the 16th). One way to approach is is that the real climb does not start till Brunisard and then it's only 600m to the Col! 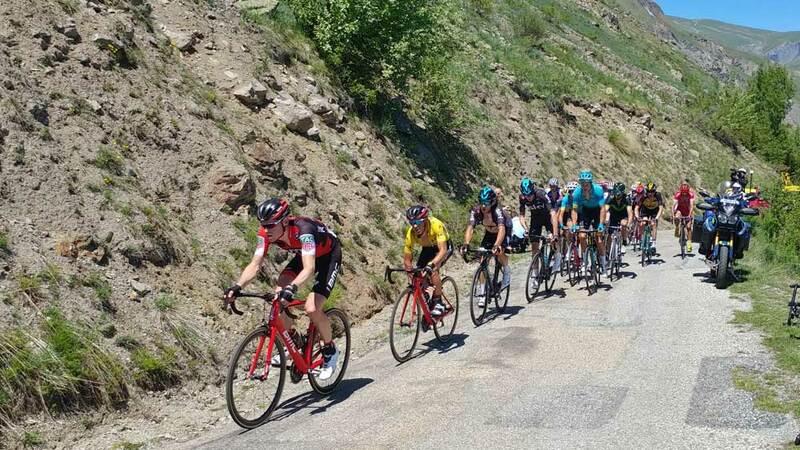 First off this Wednesday 14th June the Izoard is only open to cyclists from 11:00 - 14:00, as ever when the Cols are "Reserves" it's a great atmosphere on the mountain. More dates when others are closed here. Temps were mid to high 30's and crossing some of the torrents in flood has to be careful the dogs did not get swept away! I've ridden six days on the trot now plus last couple of days I've been doing intermittent fasting, so I was probably not in the best of condition yesterday(too weak). I've never climbed Col de Sarenne from the damn and it's tough. Unlike the TDF crowds etc are no where near as busy, I'd say not even 10%. As I was riding up road was very empty and the only people I came across, or should I say passed me, were a number of riders from Royal Dean Forest Cycling Club. 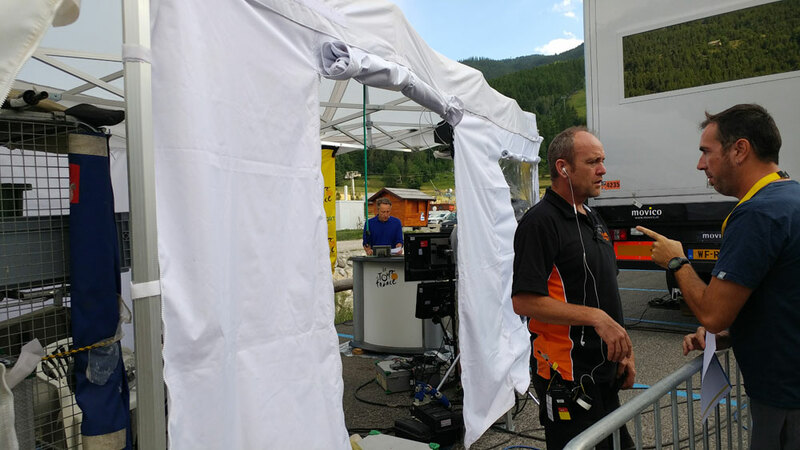 I was only 1500m from the Col and had time on my side as no sign of the Heli which always tells you the race is not far away, that said so many team cars and gendarmes on motor bikes going past, when I came across two guys from the Royal Dean Forest Cycling Club. I advised that we needed to get him out of the sun (temps were low 30's) and got my spare top out of my bag to put around his head, as we lent him against the bank I thought for one horrible minute that we were going to loose him as he just went white as a sheet and could not talk and went still, I then told the other guy I was calling 112. 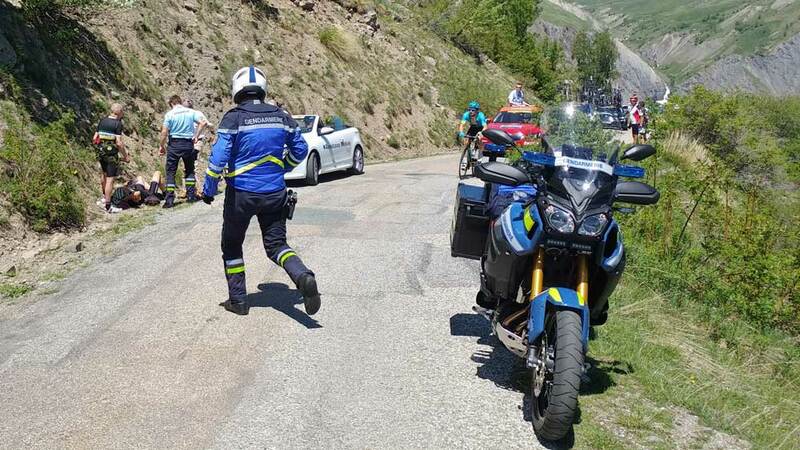 And whilst this was all going on the leaders were fast approaching, gendarme advised medic was not far away, another couple of gendarmes stopped and we lay him down on the side of the road trying to clear all the rocks. With more liquid and his mates gels he started to be a little better. When the medic arrived he explained that he'd get him taken down in an ambulance for a checkover and as the final vehicles went through I cycled up to the Col.
Now the thing was that most on the mountain were only doing the ADH/Sarenne loop, where as once I'd descended down I then had another 1,000m to get back over the Lautaret and I knew it was going to be horrible at best. I thought I'd been really good taking on water from the various fountains en route but I knew I was weak. 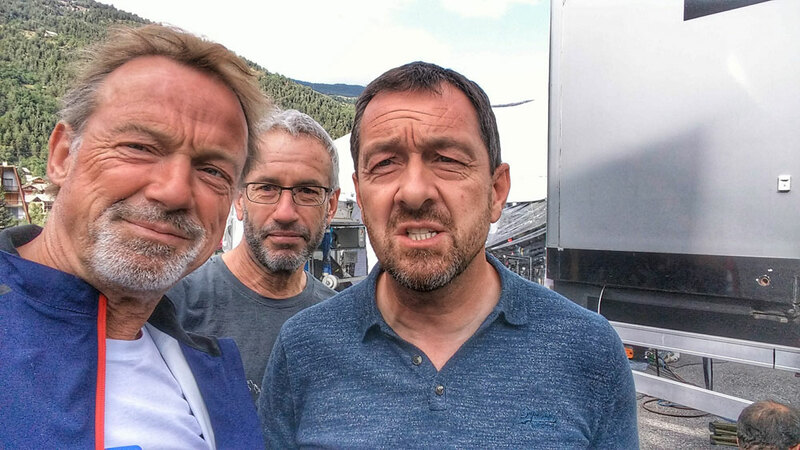 I made it to La Grave to my mates hotel and had a pitstop there, and when I left I felt good, but as soon as I went to put some power into the pedals I cramped up in the right leg. So out of the saddle and cycling at various angles (knee in, knee out) to see if I could loosen up, all the time feckin painful. It became better and then the left leg went so more of the same. And then with the cramp the nausea started, and I seriously thought about free wheeling back to LG, but somehow I made it over the Col back to Serre. This is about the third ride now where I've had trouble getting back over the Lautaret so there is some psychological shite going on in my head as well! This has to be the picture of the day, though at the time I did not realise it, only after watch the race highlights. 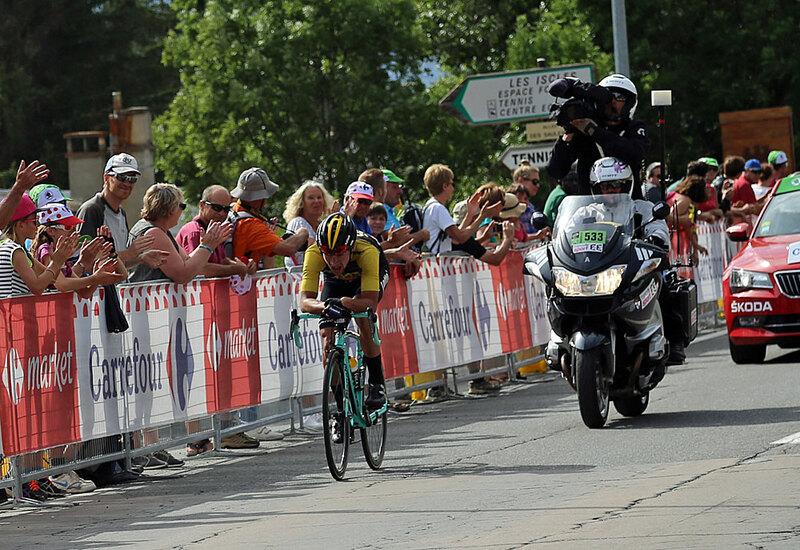 A Brit 1 / 2 at the finish - the photo is a great story of the day Peter Kennaugh 1st and Ben Swift 2nd. Yellow jersey group, Richie Porte in yellow. 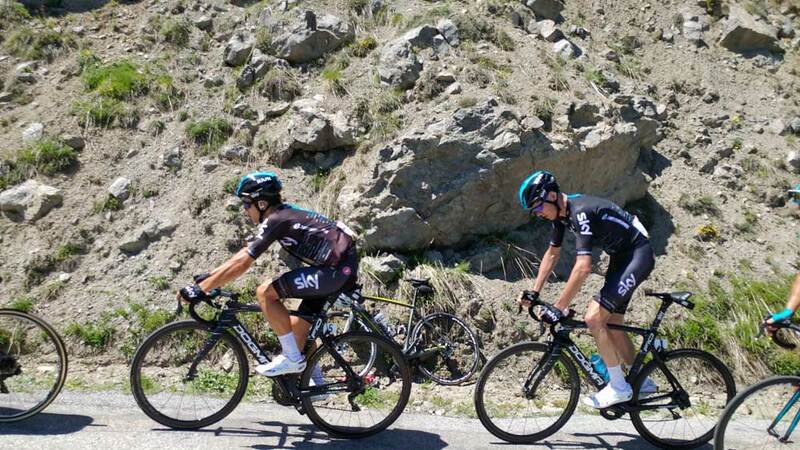 You can just make out the guy (John) on side of the road between the two Team Sky riders with a gendarme! And medic arriving with cyclists still on the climb. 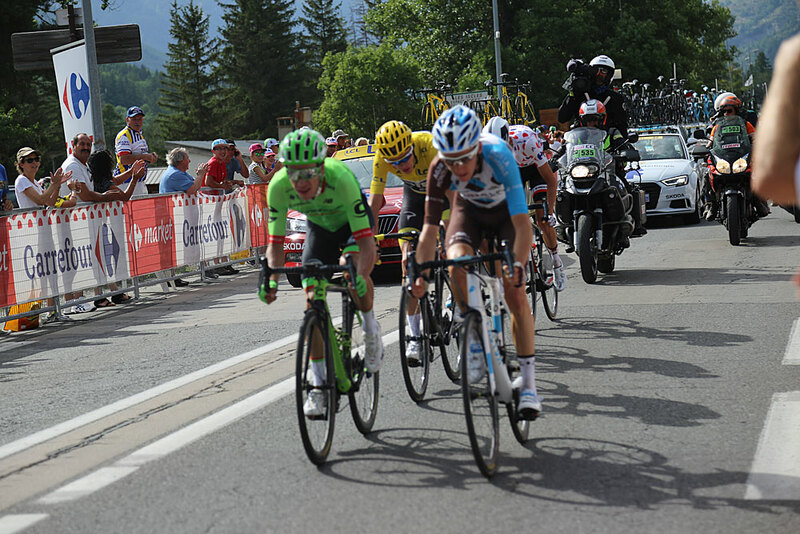 The Criterium du Dauphine is climbing Alpe D'Huez today though not by the usual road but the much tougher Col de Sarenne, so I'm cycling over that way so will be another big day on the bike! 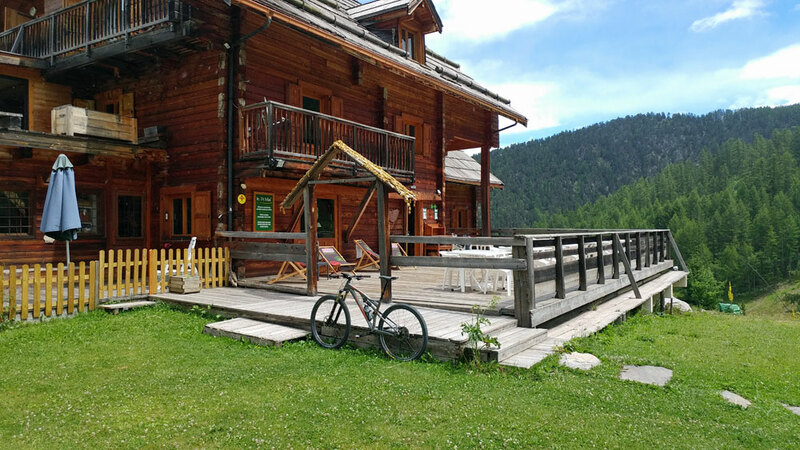 Last couple of days I've take it easy but still managed a fair few kms and vertical riding up to the Refuge Laval Haute Vallée de la Clarée which is further up from Nevache and then yesterday to the Le refuge des Fonts de Cervières which actually opens for Summer today. So hopefully I'll be posting some photos of the likes of Froome and Contador laters. So far this week the weather has not been too summer like, though finally yesterday it was nigh on cloudless skies but a tad chilly at altitude. 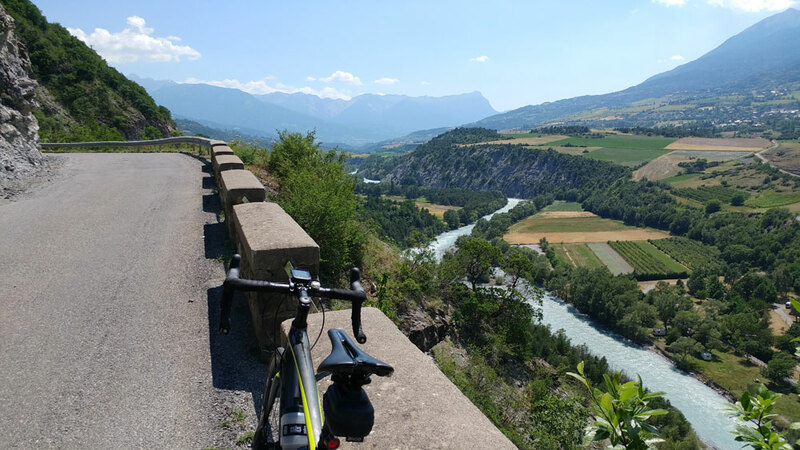 Monday and Tuesday saw a fair amount of rain but I was able to dodge the showers and get a couple of training rides in, one off road, right in front of us to the summer village of Frejus and then on the road up to Le Poët Ollagnier Climb, a steep climb up from Briancon. At one point I thought I was in for a soaking as I could see the rain in the valley, and the tell tale sign of advancing bad weather is that the wind really picks up, but somehow I managed to stay dry though battled into a strong head wind cycling back up the valley. Then yesterday with better weather, and with Elaine and Les Chiens it was up the mountain directly in front of us climbing up to the Casse du Boeuf chair (she and the dogs ran as far as Frejus summer village) and then descending back down to Aravet before then picking up the La Mélèzine bike park trail which has not been prepared for summer riding just yet. And another great video of the ride with images integrated into the vid. 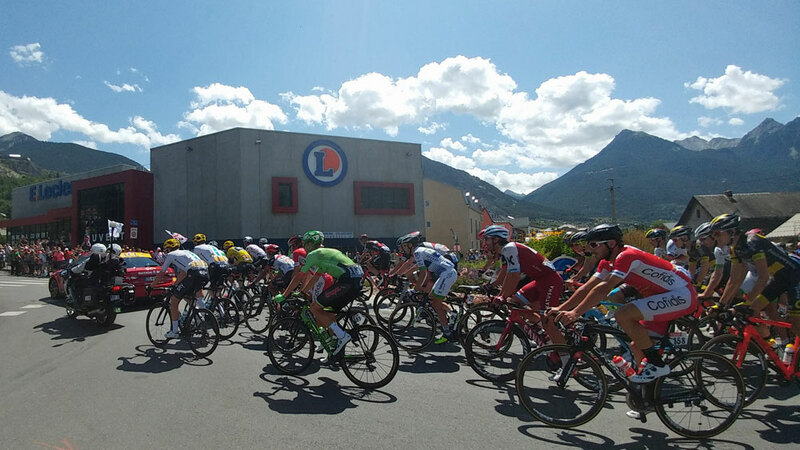 And 'Heads Up' - Criterion Du Dauphine on Saturday as they climb up from Grenoble to the damn at Lac du Chambon, where they then start the climb up to the Col de Sarenne and then on to Alpe d'Huez. I'm aiming to be over there by 12:30 as their ETA is 14;00. 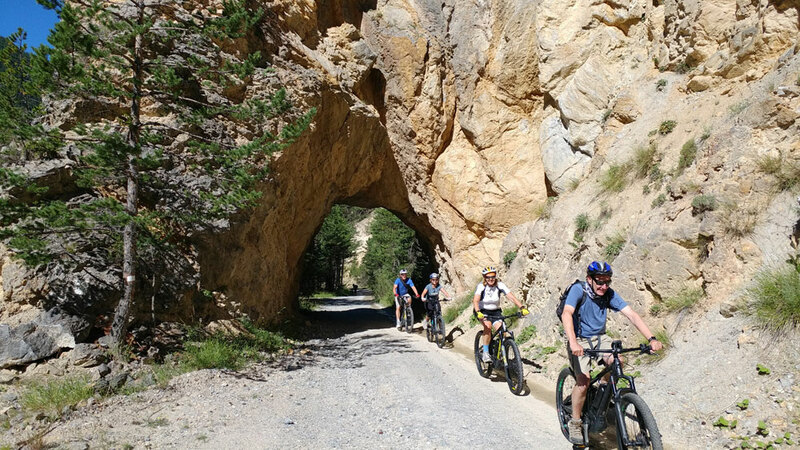 And then Wednesday June 14th the Izoard is closed to traffic and open for cyclists, 11:00 - 14:00. 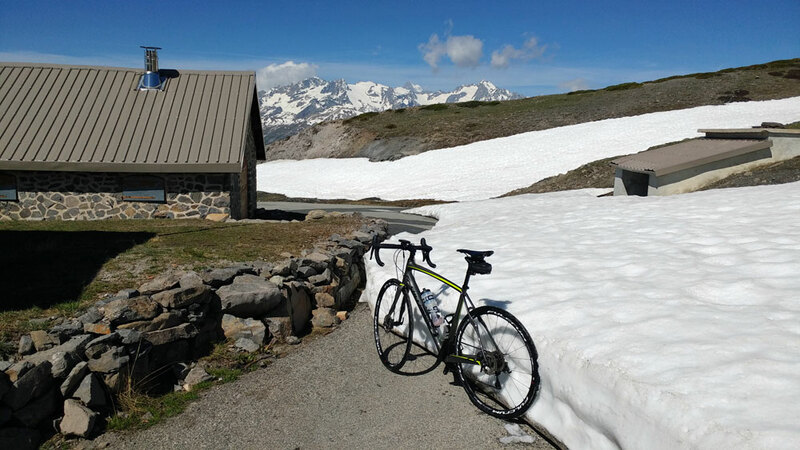 BACK UP GALIBIER - BUT WITH SLIGHTLY LESS SNOW! 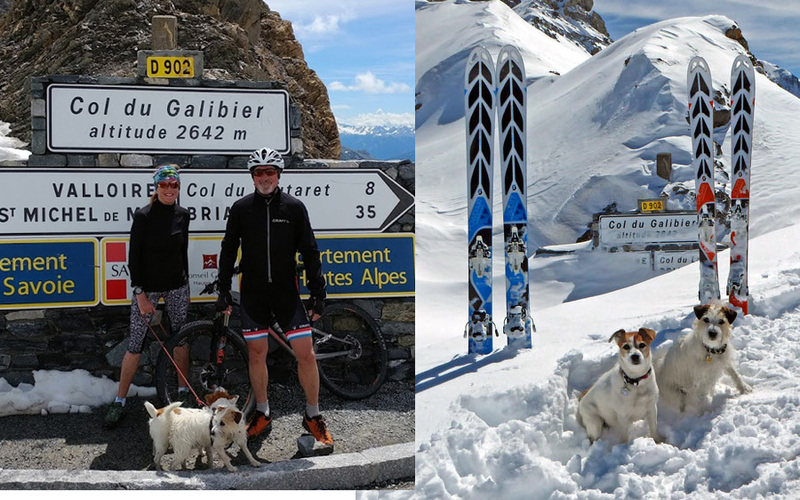 The iconic road sign at the top of the Col du Galibier is usually nearly buried by snow when we ski tour up there in the winter complete with the Rando Chiens, our two Jack Russells. 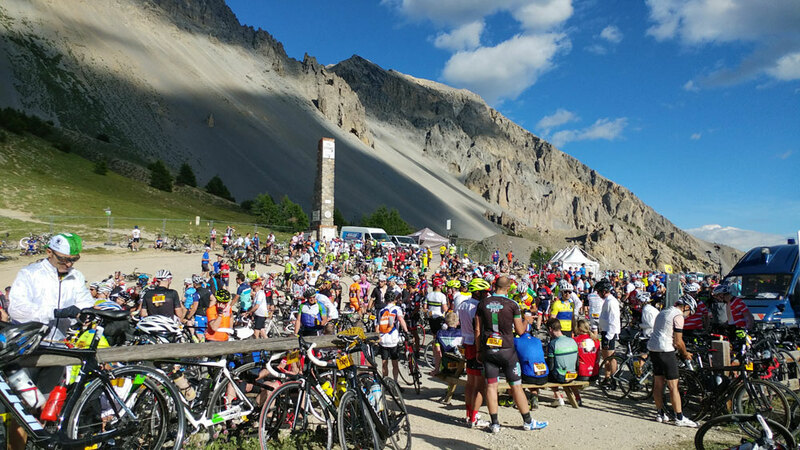 It's also traditional for us to do Galibier at least once in the summer. Me running, Gav on his mountain bike and the Randos chasing after marmot whistles. From the Lautaret road before the tunnel to the col it's around 7km and nearly 700km although, this time, Gav put in a few extra kilometres by cycling from our apartment on his road bike before meeting me and swapping to his mountain one. The old path is fairly steep and rocky, slick with running water from the snow melt. The last kilometre is on the road, currently closed to traffic but full of road cyclists heading up the final bends to the col. There's still snow up there and a chill that has everyone reaching for long sleeved tops while taking photos in front of the famous sign. Up early and left Serre and temps were low single figures. As I knew I'd be in for a long day and what with the recent afternoon thunderstorms I opted for my seat-post saddle bag so I could wear arm-warmers, long fingered spring gloves and a heavier / warmer rain jacket, then as temps rose I could disrobe and pack that kit away, and then should the heavens open I'd at least be prepared if I could find no shelter. 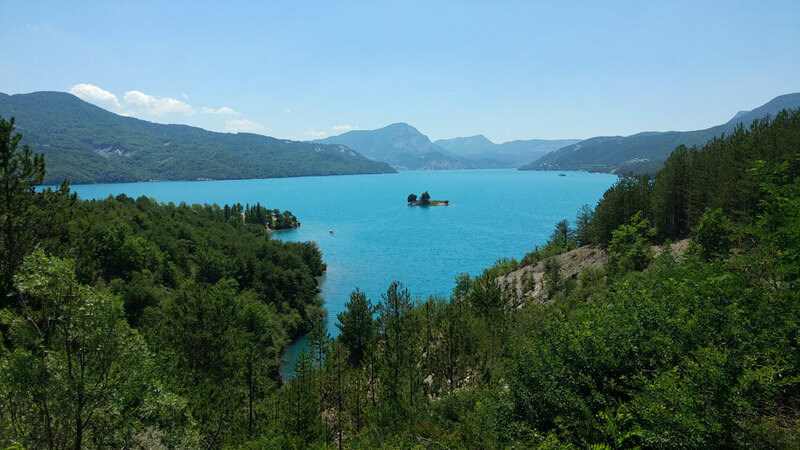 In fact temps did not start warming up till I'd reached the end of the Lac du Chambon cycling along the rescue road, then it's a climb up to Mont de Lans and then the "Traverse" before dropping down to Bour Oisans and then climb the Alpe. The previous day was the massive "Dutch Day" when thousands cycle the Alpe up to six times either as individuals or in teams, and the infrastrutcure was huge, though the road both up and down was very busy, though not with cyclists. Once at the finish, I then left the hordes and cycled past the Altiport up to the Col de Sarenne at 1,999m. Up there I then met some Dutch cyclist coming up from Clavans and they told me how yesterday late in the afternoon many cyclists had to be evacuated off the road up to Alpe D'Huez as there was a big storm with torrential rain and hail and many were suffering from the early stages of hypothermia. They were quite impressed with my setup! Here's a video of the ride with stills integrated into the video.